Not long after the first microcomputers came on the market, a then-small company, Cromemco, introduced an A to D (analog-to-digital) and D to A board for S-100 bus computers. Shortly thereafter they introduced the first joystick for a small computer. We got a pair at Creative Computing and waxed enthusiastic about the game-playing possibilities that they opened up. 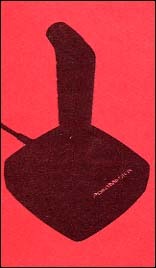 However, it was not until several years later that the Apple computer and the Atari VCS game system came on the market with controllers included. But the Apple controllers did not pass the allowable FCC emissions guideline so Apple stopped selling them. As a result, Apple owners could no longer get controls to play the hundreds of games on the market. Free enterprise came to the rescue in the form of small companies who developed replacement paddle controls for Apple owners. Surprisingly, it took much longer for the joystick to gain in popularity, perhaps because Apple never made one of their own. 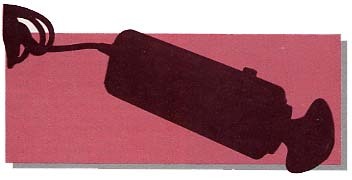 It is also surprising that, with all this flurry of activity to make Apple game controllers, manufacturers did not look sooner into the much larger replacement market for Atari VCS (and computer) controllers. Today, replacement controllers are a big business. Firms in the coin-op replacement controller business are rushing to market with home versions. Even Apple is back in the act with their purchase, about a year ago, of The Keyboard Company which has been renamed the Apple Accessories Product Division. In the last issue of Video & Arcade Games we ran a lengthy evaluation of every known controller for video game systems and home computers on the market at that time. Needless to say, new ones are being introduced at a rapid rate. Also, the controller business is beginning to diversify with cable splitters, rapid fire modules, track balls, and many other accessories. Presented here are reviews of 12 new controllers and 11 accessories. A word about our reviews: these are not one person's opinion. Each control is tested and used by all the members of our playtesting panel of adults and children. We have people of both sexes over a wide age range. Thus, our evaluations are objective, in-depth, and, we hope, useful. After many hours and days of playing coin-op arcade games, most people develop a few blisters and callouses on the thumb and fingers from holding a joystick. But have you noticed that just the opposite is true with home games? The raw spots tend to appear on the hand that holds the case of the joystick in place. We find this one of the most fatiguing and frustrating aspects of home games compared to arcade games. 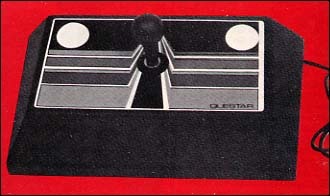 But now Questar has a solution in the form of a joystick with a huge console base. Trapezoidal in shape, the base is an average of 12 1/2" wide X 8" deep with a top that slopes from 2" in the front to 3" at the rear. It has four big 3/4" square rubber feet and a solid feel despite the somewhat light plastic construction. 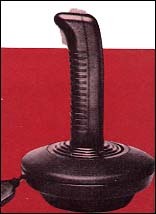 The joystick itself is an arcade-style unit with a big 1 1/4" diameter knob atop a 2 1/2" shaft. It uses four leaf switches and a rubber gimbal that permits movement in eight directions. The throw is a short 1/4" in each direction for quick response on all types of games. The unit has two big 3/4" diameter firing buttons, one on each side. Thus, it is suitable for both right- and left-handed players. The playability is great. We tried the Questar unit with the Atari VCS and Coleco video game units as well as Apple and Atari computers and it came through with flying colors. In some cases, we didn't have room to put the unit on a table and wound up with it in our laps. Still, it worked fine and required much less effort from the non-playing hand to hold it in place. The Questar unit is equipped with a generous five-foot cord and provided all-around excellent playability. During the past year, Wico, a major manufacturer of replacement controls and parts for the coin-op industry, introduced a comprehensive line of controllers for home games. We tested seven Wico controllers and accessories and found them to be of generally excellent quality. Wico makes three joysticks that are outwardly somewhat different, but internally are identical. They are called the Command Control Joystick, Joystick Deluxe, and Famous Red Ball Joystick. We playtested the standard and Red Ball joysticks. The Deluxe model is the same as the standard model except that it has a larger housing, the top of which is slanted back at an angle of about 15 degrees. All three are switch-type joysticks of the Atari flavor although they can be used with other systems with appropriate Wico (and other) adapters. The standard and Red Ball sticks have a 4 1/2" square base with pronounced rounded corners. It is 1 1/2" high but rises nearly another inch at the center where the stick is mounted. The standard stick is 4" long and tapers to just shy of 1" in diameter at the top. The Red Ball stick is 3 1/2" and terminates in a hand-filling 1 1/2" ball. The internal mechanism on all the Wico sticks is of arcade design. A nylon ball at the lower end of the shaft presses against the contacts of four leaf switches. There are all types of leaf switches ranging from just two pieces of spring steel to high-quality switches like these; the contacts are diagonal to each other and a second piece of spring steel is mounted behind the "fixed" contact to insure that it does not get distorted after hours of hard use. The joysticks are equipped with two firing buttons, one on the top of the stick and the other in the "usual" place on the top left corner of the housing. A small slide switch in the lower center of the housing selects which firing button is to be used. This is handy because if you are used to a full-fisted grip on the ball, you could easily press the firing button accidentally. On the other hand, if you want to use the button in the stick, having the other one deactivated means that you can hold the housing any way you wish without danger of unintentionally loosing off a shot. The smallish 3/8" diameter firing button in the handle has a very short throw (less than 1/16"), however, the one in the housing is much longer. Never fear, you won't miss with the large 3/4" button. The Wico joysticks provided excellent playability on all games. The red and black styling is attractive, as are the packaging and instruction booklet. The high quality design means they should stand up for a good while; indeed they come with a one-year warranty. They get our highest rating. With the Competition-Pro joystick, Coin Controls joins the ranks of coin-op replacement equipment manufacturers taking arcade-style joysticks and putting them in a case for home use. The Competition-Pro uses four leaf switches activated by a nylon bushing on the end of the joystick shaft. The shaft is held by a rubber gimbal that permits movement in any direction. This is sometimes called eight-way movement since the stick will activate one switch in the N, E, S, or W directions and two switches in a diagonal direction. The joystick has a big 1 1/4" no-slip ball as an integral part of the nearly 3" shaft. Throw is a short 1/4", providing good control in most games. Two big 1" diameter firing buttons are mounted on each side of the top of the housing, so the stick is equally suitable for right- or left-handed players. The firing buttons have an extremely short throw which helps in getting off a barrage of quick shots in shoot-'em-up games. The case is somewhat larger than the original equipment Atari stick, measuring 3 1/2" X 4 1/2". It has rounded corners so it is less fatiguing to hold than some other units. Four small rubber feet make it suitable for table top use as well as hand held operation. 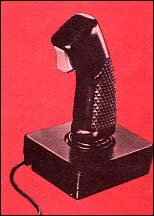 In summary, the name says it all--"Competition-Pro," a competition joystick for the serious player. The PointMaster joystick represents a new direction for Discwasher, the record care folks. We're happy to see it. PointMaster has a handle best described as being for a fist grip. Unlike joysticks that have a ball on top of a shaft, the PointMaster has a partially contoured handle a full 4" long designed to be gripped with your entire hand. The rectangular firing button sits on top of the handle and is pressed with your thumb. No right or left hand favoritism here; you press the button with the same hand you have wrapped around the handle. Firing button movement is exceptionally short and fast. Some players didn't like thumb control, but they were in the minority. The mechanism is similar to that in the original Atari stick, i.e., movement of the stick activates small dimpled contacts on a printed circuit board in the base of the unit. Throw is a longish 1/2", but this is hardly noticeable with your entire hand wrapped around the stick. Players especially liked the PointMaster for shoot-'em-up games (for Star Raiders, it is dynamite!) but had mixed reactions for maze games (Pac-family) and jumping games (Frogger family). However, the stick can be gripped with the thumb and forefinger for maze and jumping games and led to some excellent scores. The base is 4" square with rounded corners and the cable is five feet long. All in all, an excellent stick, particularly for games requiring fast maneuvering and firing. Our first exposure to the Super Champ Joystick was when we met Andy Wu and Eugenia Chan of Championship Electronics at the Winter CES. They were selling their prototype Hong Kong-made joysticks on the closing day of the show. However, they asked that we wait a few weeks for a final production unit. It was worth the wait! This joystick is designed using the lessons of thousands of hours of play with other sticks. The handle is the type that you wrap your hand around. At 4 1/2" in circumference, it is suitable for both adults and children. Some people like a top-mounted thumb-activated firing button; others like a trigger type activated with the forefinger. Super Champ has both. Furthermore, they have an extremely short throw, providing fast action in all types of games. We have come to expect that joysticks with a long 5" handle as found on Super Champ require at least 1/2" movement (at the top) to activate the switch contacts. Not so with this stick; just a tad over 1/4" activates the contacts thus making it one of the quickest sticks with which we have ever played. A novel idea on the Super Champ is the cord winder in the base of the unit. You simply pull the cord out to whatever length you wish (up to an astonishing 9' 9"), and, when you are finished playing, turn the joystick handle to wind it back into the base. This does lead to one slightly disconcerting factor: the joystick is free to rotate (as though it is winding the cord) during play of a game, however, it did not seem to hamper game play. Four suction cups on the base of the housing hold the joystick to any smooth surface. If you have such a surface available, you'll appreciate this feature as it helps to eliminate the aches and fatigue from holding the joystick housing with your non-playing hand. If it sounds as though we are enthusiastic about the Super Champ, we are! This is a high quality joystick that will bring you many hours of first rate playability. The Triga-Command joystick appears at first glance to be a massive unit although the base measures only 4" square by 1 1/2" high. The handle, however, is designed to be gripped by the whole hand, preferably a large hand, as it measures nearly 6" in circumference and 5 1/2" in height. Children and women will have a tough time getting their hands around this monster. A lever-type trigger is mounted in the top of the joystick handle. In contrast to its massive size, the stick moves exceptionally easily and responds to the slightest touch. This was somewhat disconcerting at first since we had the impression that something designed to be gripped by one's whole hand required strength to move. Once we got used to the light touch, we found the stick excellent for Star Raiders and similar games. It was less suitable for maze games, being almost too responsive. With the trigger in the handle, it must be fired by the forefinger. For certain games, we prefer firing with the opposite hand from the one controlling the stick; this, of course, was not possible with the Triga-Command. Triga-Command has four suction cups on the bottom so it can be affixed to a smooth surface for really serious play. Unfortunately, under vigorous use, the suction cups pulled out of the base and we soon found ourselves with a handheld unit. Triga-Command has some nice strong points (large grip, forefinger trigger, high sensitivity) but some offsetting weaknesses. We advise you to try it if you can before you buy one to make sure it meets your needs. We reviewed the Video Command stick on these pages previously, however, Zircon has made an important design change that improves playability enormously. In particular, they have added a firing button in the handle of the unit. The Video Command unit is designed to be held with one hand while the moveable stick is manipulated with the other. Alternatively, the thumb of the hand that is holding the unit can be used to move the stick. The stick makes contact with very little movement and gives fast maneuverability in all games. Now, in addition to the quick movement, the unit provides fast firing with the handle-mounted button. This is easily activated with either the forefinger or middle finger of the gripping hand. While the Video Command unit was well-liked by members of our playing panel, some children and adults with small hands seemed to have trouble getting a good grip on the largish handle (5 1/2" circumference). The Video Command unit has an extra-long six-foot cable. More important, it was the stick used to get some of the highest Star Raiders scores ever. In our previous review of the Kraft Apple paddle controls, we noted that our playing panelists had mixed reactions to it having only 60 degrees of rotation (compared to 300 degrees on most other units). Kraft obviously heard this from other customers as well and has redesigned the control to provide 180 degrees of rotation. We feel that this is a happy compromise. With less rotation, your hand doesn't have to get into awkward positions to adjust the control to its extremities. Although most people have learned to cope with 300 degree controls, less rotation is really much more pleasant. Panelists still had mixed reactions about the large 2" diameter knurled knob with some still showing a strong preference for a small 1" to 1 1/4" diameter knob. Seems to be a matter of personal preference. The Kraft housing is a bulky 4" X 4" X 2 1/4" with a 3/8" square firing button located on top in the upper left hand corner, a position favoring righties. It provided good firing control and was not fatiguing to use. In summary, with 180 degrees of rotation, the Kraft paddles provide precise control for the most demanding game player and, if 2" knobs are your cup of tea, you won't find a better unit on the market. In our review of the Spectrum Projects joystick, we noted that things were looking up for Color Computer owners with second source joysticks starting to hit the market. Now, with the Kraft entry, the situation has taken a mighty leap forward. Kraft produces an outstanding Apple joystick and they have now taken that technology and applied it to one for the Color Computer. The joystick knob is 3/8" in diameter on the end of a 2" shaft. The shaft moves two good quality potentiometers. Centering in each direction can be adjusted by means of two small levers which rotate the "home position" of the pots slightly. A delightful feature, which we wish was on more joysticks, allows self-centering to be turned on or off without opening the housing. Two small switches on the bottom of the housing permit you to engage or disengage self-centering at will. Until now, Color Computer owners have not been able to experience the joys of a self-centering joystick, much less one that can go back and forth. We guarantee that you will be amazed at the improvement in game playability with this feature; one playtester raised all of his previous high scores by 15-25% with this stick. The action of the control is neither too loose nor too tight; it is just right. The firing button has a longish throw, but its action is more positive than that on the original equipment stick. The firing button is on the top of the housing in the upper left corner thus favoring right-handed players. All in all, the conclusions about the Kraft Color Computer joystick are the same as those in our previous review of the Kraft Apple joystick, namely, "highly recommended." Atari developed the first ball controller for a coin-op game back in 1978. It found its way onto several sports games but not until Centipede was the popularity of ball controllers proven. Atari has trademarked the name Trakball, so everyone else must use the generic term, track ball. As with joysticks, there are two fundamentally different kinds of track balls. The type used on coin-op games and the Atari and Wico home game controllers sends a series of pulses to the computer or game circuit as the ball is moved. (We'll discuss one way in which this is done in our review of the Wico controller.) In the second type of mechanism, used on the TG home unit as well as some military controls, the ball controls the position of a pair of potentiometers. Thus, it is much like a joystick in its operation and can generally be substituted for a joystick on the computer. In the TG track ball controller, a 2" diameter ball rests in a cradle of three rollers. One roller is geared to the Y potentiometer, one to the X pot, and the other is a free roller diagonally opposite the other two. The pot to roller gear ratio is 3.4:1 and the roller to ball ratio is 1:2, thus it takes 1.7 rotations of the ball to move the pot from one extreme to the other. How did it work in game play? Unfortunately, there were some minor glitches. If the ball gets at all wet from a sweaty palm it tends to slip a bit; remember these are plastic rollers turned by friction and water is an excellent lubricant. Moving the ball to the right and down provided positive, accurate control. This is because in these directions the ball pushes the roller shafts down into their bearings and thus the gears make good, positive contact. Movement to the left and up tends to lift the roller shafts just a tad and they push against the posts in the top of the housing which seems to have just a bit of "give." Apparently this allows the gears to come apart slightly and thus not provide perfectly accurate control. This is reasonably easy to remedy by rolling the ball slightly less violently than one might be tempted to do in vigorous game play. Since the track ball must be rolled considerably further than a joystick must be moved (1.7 turns is subjectively much further than moving a joystick handle 2"), the control seems to be sluggish compared to a joystick. Thus, although it is electrically equivalent, we did not find that it could be substituted on a one-for-one basis from the standpoint of playability. Naturally, we tried the control on Apple versions of Centipede and Missile Command (Photar, Nightmare Gallery, and ABM). We found it quite satisfactory for playing ABM, adequate for Nightmare Gallery, and unsatisfactory for Photar. We tried it on several other games with the same mixed results. In summary, the TG track ball controller is a novel and interesting device. If you already have paddles and both potentiometer and switch-type joysticks, you will certainly want to get a track ball. As this is the only Apple version currently available that works with existing games, you don't have a wide range of choices. Wico has introduced five trackball controllers for Atari games and computers (also Vic), TI, Apple, TRS-80 Color Computer, and Odyssey video game units. We playtested the Atari version. The ball rests on two perpendicular rollers and a third idler roller diagonally opposite. Each roller is held in two ball bearings, each of which rests on top of a small spring. Even the idler roller is actually a ball bearing. Thus everything is designed to make the ball roll as freely and easily as possible. Furthermore, we got no slippage whatsoever, even when the ball was moist with sweat. The method of producing a signal for the computer is ingenious. On one end of each roller shaft is a 1 1/2" disk with 24 small holes. The disk rotates within the beam of a miniature light and photocell. As the light beam is broken by the rotation of the disk, it transmits an impulse to an integrated circuit in the trackball. It is the job of this IC to determine which direction the disk is rotating and transmit an appropriate signal to the computer. This signal is equivalent to moving the joystick in one or two directions. On both the Atari and Apple trackballs, the power for the photocell and IC are supplied by the computer. The other three require an external AC power supply (included). So the Wico trackball is an engineering marvel; how does it work? In a word, it is sensational. The firing button in the upper left corner of the housing favors righties; however, it is a big 3/4" in diameter and has a short, quick throw. We tried the trackball with Missile Command and scored higher than ever before. Centipede is now just like the arcade game and even many computer games designed for a joystick or paddle controller work fine with the trackball. On the other hand, owners of other computers, notably the Apple and Color Computer, should be aware that the Wico trackball for these machines is not a one-for-one replacement for the standard analog type controller. Hence, few currently available games will work with the Wico trackball on these computers. However, we would expect to see new ones coming out soon with trackball compatibility. 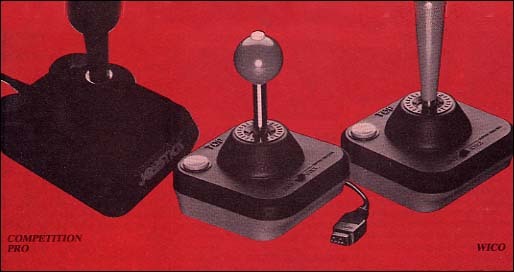 Wico makes four adapters that allow switch-type joysticks to function with computers and game units other than Atari, Coleco, and Vic. Adapters are available for the TI 99/4A, Apple II, TRS-80 Color Computer, and Odyssey video game. These are solid state controllers, each one consisting of four transistors, four potentiometers, and 16 or 18 resistors. Each permits two switch-type joysticks to function with one of the above computers or game systems. This does not mean that all games on these computers will magically be able to use switch-type joysticks. Many will be able to, but far more will not be compatible. For the most part, maze-type games that require movement in four directions will be able to use the adapter/joystick combination, but games that utilize the exact position of an analog-type joystick or potentiometer will not function with this type of input. Unfortunately, you will not be able to tell which games can use this input until you actually try them out. We thought that some games would work but they did not, while others surprised us by working when we predicted that they would not. On the Apple, for example, when the joysticks are properly connected, they give output readings of 0, 128, and 255. For the Color Computer, the outputs are 0, 31, and 63. A sample program is included in the instructions to check these values. The trim pots in the adapter can be adjusted (two of ours had to be) to give these values. Functionally, this is the same as the Sirius Joyport, although the way of achieving the result is quite different. In general, games which are designed to use the Sirius Joyport are considerably faster with the Joyport than with the Wico adapter; however, with games that use standard analog joystick input, the Wico adapter is slightly faster than most analog joysticks. For the TI, Color Computer, and Odyssey units, the Wico adapter is the only alternative to analog joysticks and is a joy to use with games for which it works. 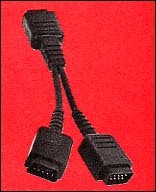 One of the most useful little devices for video game systems, particularly the ColecoVision, is a cable splitter. This nifty device plugs into the joystick port (Atari, Vic, or Coleco) and terminates in two male connectors into which you can plug two joysticks. Why bother? Several reasons. First, many two-player games in which players alternate turns require that the joystick be passed from one player to the other. With a cable splitter, each player can use his own joystick and passing back and forth is no longer necessary. With ColecoVision, a good quality joystick Questar or some other) can be plugged in along with the Coleco unit. The keypad on the Coleco unit can be used for game and speed selection but the other joystick can be used for actual game play. We guarantee you will be astonished at the improvement in your scores using a high quality stick, and this cable splitter makes it easy as pie. For just a couple of bucks, it is something you won't want to be without. Thanks, Questar. Two companies, Questar and Discwasher, have announced rapid fire modules designed to be connected between the joystick and video game unit. The Discwasher unit is 2" long and has a male and female DB-9 connector on each end. It is an "active" unit and requires power from the Atari VCS to make it work. Thus, it will not function with Atari or Vic computers nor the Sirius joyport nor ColecoVision. It provides a constant high rate of fire about as fast as you could constantly press and release the firing button. However, it doesn't get tired whereas most people do. The Questar unit is a "passive" design and works from energy stored in a capacitor which is recharged from directional contacts. Thus it should work on all videogames and computers which accept a switch-type joystick. We say "should" because we have only seen a prototype Questar unit. Also, unlike the Discwasher unit, the Questar has a continuously variable rate of fire selectable with a small potentiometer mounted in it. Beware: contrary to some advertising claims, rapid fire units will not work with all games. In order to work, the game must permit multiple shots on the screen and must check the firing button reasonably frequently for input. In general, rapid fire modules are most suitable for games in the Defender and Asteroids families. There is no question that blisters and callouses are the battle scars of playing arcade games and even some home games. Daily soaking in Palmolive won't make these callouses disappear; about the only thing that will is total abstinence which, of course, is quite unacceptable. Now, however, Nancy Heck of Nancy and Company has a better idea--a game glove. In the package, the glove looks like a nasty gesture; it has only a middle finger and thumb. A double layer of reinforcement is provided on the inside of the thumb, side of the middle finger and across the top half of the palm. This provides ample protection for the three most popular gripping techniques. The palm and front of the two fingers are made from soft, supple leather while the back is made of a porous nylon mesh. A velcro fastener allows you to adjust the glove as tightly as you wish around your wrist. The glove is available for the right or left hand; in mens, ladies and youth sizes: small, medium, and large; and in white, navy and gold. 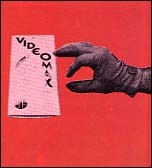 Did the Videomax glove improve game scores? No. But it did halt the formation of new blisters and callouses, and if you want to hold hands after a day defending the galaxy, that's important. If the glove is not available locally, it costs $7.95 by mail from Nancy and Company, P.O. Box 332, Hayward, CA 94541. So you still have that Atari joystick and haven't anted up the bucks for an arcade-style stick. Here is an alternative. Astro-Grip is a dense foam rubber cylinder that slips over the standard Atari joystick. The joystick handle is then a bit over an inch in diameter with a no-slip gripping surface. Astro-Grip becomes semi-permanent after installation and if you try to remove it, little bits of dense foam will be left on the joystick handle. Frankly, we can't see any reason to remove it once it is installed. Did it make a difference? You bet. Although it doesn't magically transform the Atari stick into an arcade unit, it improves playability and lessens the fatigue of gripping the sharp top of the Atari stick. Along the line of Astro-Grip for the Atari joystick is Thumb Saver for the Mattel Intellivision (and Tandy and Sears clones) game controller. Thumb Saver is a 3/16" thick X 1 1/4" diameter rubber disc with a sticky backing that sticks on the directional disc control. The manufacturer, Video Masters, claims that Thumb Saver improves control response. We have our doubts about that claim, however, it certainly was easier on the thumb than pushing that metal disc on the original controller. Packaged in a box exactly the same size as an Atari VCS game or Apple disk game is this handy little kit. The box tells us, "It's your job to defend against 'Red Eye Attack,' escape from 'Blisters and Bruises' and avoid 'Video Headache.' " Will this kit help? Maybe, and maybe not, but it certainly is fun. 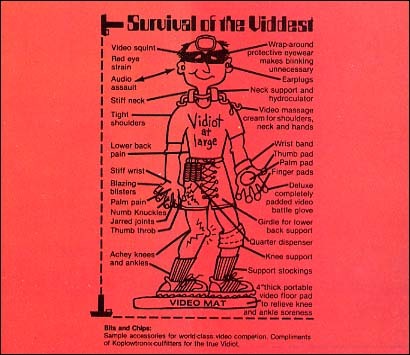 Put together by Jim Koplow of Koplow Games, the Video Survival Kit contains two smallish T-shirt transfers ("I'm a Vidiot" and "Do not disturb Quarter Master at work"), 11 colorful stickers of various sizes, a pair of disguise glasses with bloodshot eyes on a black background, eight passout cards ("May I Be Next?" "Vidiot at Large," etc. ), a cardboard quarter holder, ID card, video finger splint, metal Vidiot pin, and eight-page instruction sheet with a 56-word crossword puzzle (you'll need a pencil for this one). The idea is cute and the kit will provide a few yucks (for a few bucks) for your favorite game freak or even yourself.